I would like to introduce two very inspiring pieces for your entertainment. MC Yogi, a yogi in America who churns music with spiritual and worldly elements and Omar Musa, an Australian with Malaysian ancestry, winner of the Australian Slam Poetry Award who writes and presents poetic depictions of reality. I hope that you will enjoy the following videos. Parts of plants that people commonly associate with being edible are mostly the leaves and fruits. Flowers are mainly used for decoration and of course an important reproduction tool for the plants. Below I would like to share with you two of the most interesting flowers which can be consumed. The pink buds of Bunga Kantan ( Bunga Siantan aka wild ginger flower or Etlingera Elatior ) is commonly found in a curry based dish from the Peranakan culture ( merger of Chinese and Malay ). This dish called the Nyonya laksa can be found in Malaysia, Singapore and Indonesia but is more popular in Malaysia, mainly the states of Malacca and Penang. I find the taste and color of this mildly tangy, sweet and fragrant flower interesting and thought it a little underused. 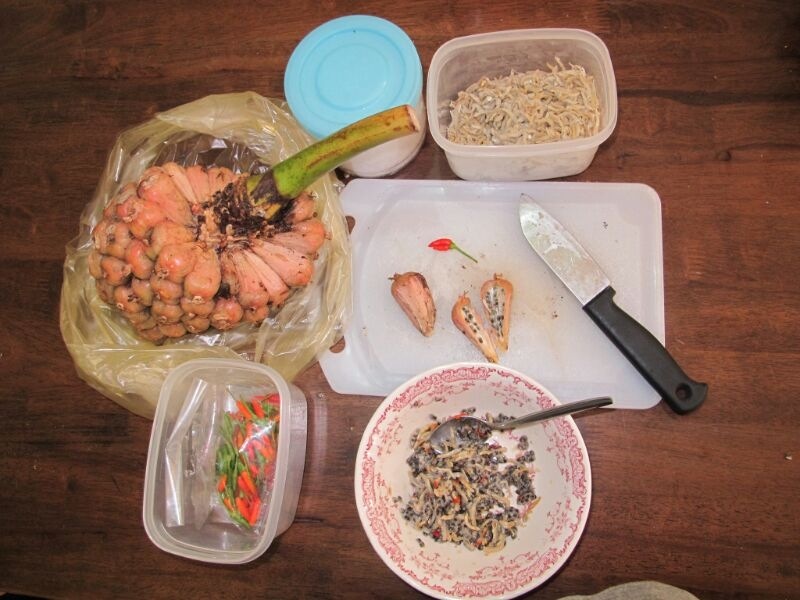 Hence, I would like to introduce the use of the bunga kantan flower bud in a few dishes. My favorite use of it is in salads. It can easily replace lemon juice, which is a common acid based ingredient. In a one person portion salad, I suggest the use of half a flower bud, thinly sliced and chopped. Other than that, you can also use it to spice up your fried rice dish. Just throw the chopped bits into the rice when you are almost done frying the rice and mix it well. I hope to find more uses of the bunga kantan flower bud but at the moment, I have to be contented with these 3 recipes. If any of you readers have been using it in your cooking, please feel free to share it with me. 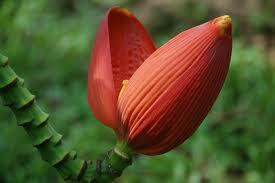 Now, let’s put the flower buds aside and discover the use of its fruits. I have never seen a bunga kantan bud flowering and producing fruits myself but apparently it looks a little bit between a pineapple and a pandanus fruit but pinkish-white in colour. A close friend, now living in Sabah recently told me that the Sabahans use these fruits in a type of chilli-pickle side dish. She said that the ripe seed pods (smaller than the seeds of passion fruit ) from the fruit is mixed with diced up birds eye chillies, salt and pan roasted fine anchovies. This can then be kept in a jar for some period of time and eaten with warm steamed rice. Jantung Pisang literally means ‘heart of banana’ although this part of the plant is not actually the heart of the plant it is somehow shaped like a heart, usually dark purplish in colour. It is actually made of layers of the whitish banana flowers enveloped in purplish skin-like sheets. When allowed to grow, these sheets would drop on the ground exposing the rows of flowers, ready to bloom and be pollinated by various insects to produce the bananas that we all love to eat. The jantung pisang can be eaten but it has to be cooked (either boiled or steamed) first as it contains high content of sap when raw. It can be cooked in broth-like dishes with herbs and coconut milk or it can be presented like salad with a dip. These dishes are mainly eaten in Indonesia, Thailand and Malaysia. The main ingredient to be used either in the broth or the dip is a rhizome called cekur ( Kaempferia galangal ) pounded along with chilli, shallots, garlic & coconut milk, sometimes with grated coconuts too.